A note: I have decided to expand this blog’s focus to include listed microcap and/or illiquid securities. The unlisted world is and will remain my bread and butter, but I am simply finding more opportunities for profit outside that world than I can ignore. Logistec is one of those opportunities. Logistec provides stevedoring and cargo management services. Simply put, Logistec manages the loading and unloading of ships that come to harbor, as well as cargo storage and warehousing. Logistec also has operations in environmental remediation through its subsidiary Sanexen Environmental Services and manufactures woven hoses. Logistec has been in operation since 1952, when it was founded as Quebec Terminals by Roger Paquin. 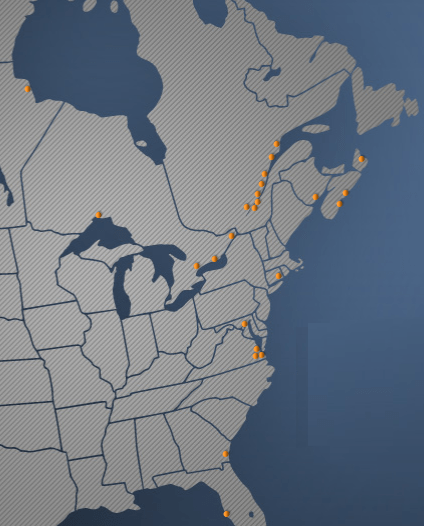 Logistec operates in 24 ports in Eastern Canada and the eastern coast of the US. Half of these ports are located on the Great Lakes or along the St. Lawrence Seaway. The Great Lakes and the St. Lawrence Seaway are Canada’s connection from its economic centers in Ontario and Quebec to the Atlantic Ocean and foreign trading partners. Ports along these bodies of water allow for goods and commodities from Canada’s interior to be shipped around the world. Ports and ports operations are great businesses. The world supply of ports is limited due to geography, so ports and associated companies enjoy high barriers to entry and associated pricing power. World trade tends to increase over time, providing a natural revenue growth tailwind. Logistec is a classic “toll-taking” company that profits on trade volume, irrespective of shipping rates or commodities prices. Logistec is capable of handling all kinds of commodities, including metals, agricultural products and forest products. Logistec enjoys long-term leases at the ports where it operates, ensuring the profits will flow for years to come. And how the profits have flowed. Logistec’s record of growth and profitability is nothing short of incredible. Logistec has never lost money in its existence as a public company. Beginning in 1969, Logistec has reported 43 consecutive years of profits. The company has paid a dividend in every one of these years. Top-line growth has been impressive as well. From 1969 to 2012, Logistec grew revenues from $5.94 million CAD to $250.86 million CAD, a compound annual growth rate of 9.1%. The company achieved all of this using minimal leverage. To help visualize this achievement, the company provides this graphic on its website. Revenues sank when world trade volumes dipped during the recession, but have now rebounded. A healthier world economy combined with a few smart acquisitions has allowed Logistec to post record revenues and profits figures. For the first quarter of 2013, Logistec reported an impressive revenue increase of 44.0% year-over-year in its marine services division. This increase is largely due to the company’s mid-2012 acquisition of CrossGlobe Transport, Ltd. CrossGlobe operates in three terminals at the Port of Virginia, handling forest products, auto parts and other cargoes. Logistec’s business is slowest when the St. Lawrence Seaway is closed during the cold Canadian winter months, so the addition of another southern port to the company’s operations resulted in a large increase in first quarter revenues and earnings. While marine services account for the majority of Logistec’s operations, the company’s Sanexen Environmental Services subsidiary is another important profit center. Sanexen provides environmental remediation at industrial and disaster sites (the company is working at the site of the recent Burlington, Ontario train crash) and also does environmental studies. Interestingly, the company has developed a technology known as Aqua-Pipe, which can be used to rehabilitate aging underground water lines. The advanced ages of many municipal water distribution systems could result in increasing demand for pipe rehabilitation.Sanexen’s 2012 revenues rose 14% from 2011, eclipsing $100 million for the first time. Logistec holds a 69.7% interest in Sanexen, with Sanexen’s management holding the remainer. Logistec maintains a strong balance sheet. Net debt is only $12.18 million CAD, 0.33 times EBITDA. Total debt is $20.12 million CAD, 15.68% of owners’ equity. The company maintains multiple pension plans, but each of these is fully-funded, even at the 2012 discount rate of 3.8%. For the twelve trailing months, Logistec earned $19.21 million CAD, or $2.97 CAD per share. The company has two classes of shares outstanding. A shares are entitled to 30 votes per share. B shares are entitled to just one vote per share, but receive 110% of the dividends paid on A shares. (If A shares receive $1.00 in dividends, B shares receive $1.10.) B shares currently trade at a precise 10% premium to A shares, though they have historically traded at a slight discount. A shares currently trade at $28.51 CAD and B shares trade at $31.39. Based on the number of shares of each class outstanding, Logistec has a market capitalization of $192.19 million CAD. Adding net debt gives a total enterprise value of $204.37 million CAD. On the whole, Logistec trades at 10.01 times trailing earnings. A shares trade at 9.60x, while B shares trade at a 10.57x. The entire capital structure goes for an extremely reasonable 5.57 times EBITDA. 10x earnings or 5.5x EBITDA is a compelling valuation for a company with Logistec’s competitive advantages and enormously successful track record. Keep in mind that Logistec’s trailing figures include less than a half-year of CrossGlobe’s results. Included, these would push down the multiples a bit more. The market does not offer many opportunities to purchase businesses of such quality at these multiples. For as long as people across the world demand goods and services, ships will ferry commodities across the oceans. And for every ship that enters the harbor, someone will have to load and unload it, coordinating the process and ensuring efficiency. One reason for Logistec’s low valuation is its illiquidity and obscurity. Despite its 61 years in operation and exceptional returns to shareholders, the company remains tiny, with a market cap under $200 million. And its shares are illiquid. Logistec is controlled by Sumanic Investments, which is in turn held in equal parts by three daughters of the company’s founder, Roger Paquin. One of these daughters, Madeline Paquin, serves as President and CEO of Logistec. Over the last three months, each classes of shares has gone days without trading, and the highest volume day for either share class saw only 1,900 shares change hands. Logistec pays a small dividend, with occasional larger special dividends. Shares (both classes) currently yield 1.3%. The company engages in small share repurchase programs, reducing shares outstanding by 1.8% since 2010. Risks to Logistec’s success include major shifts in global trade patterns, or a great leap in port technology that Logistec cannot afford to adopt. A prolonged global recession would sharply reduce earnings in the short run. Foreign investors must also consider currency risk. The Canadian Dollar has lost ground lately as commodities tumble. I own shares in Logistec. Thanks. This is not a company that will go up 200% this year. But it is a company that stands an extremely good chance of returning better than 10% annually for many years to come, with low risk. I’ll take that kind of compounding where I can find it. Amen. Thanks for writing it up. Since your excellent post, the company has issued 2 excellent quarters. For example, last quarter EPS was up around 70%, just by being a very efficient operator. It looks like almost all the increase in maritime revenue went to the bottom line. Logistec is a business operating very close to where I live, and I can tell you that shipping wood pellets to Europe is a big success. People are even complaining of the ugliness of those big stockpiles in the Quebec city newspapers 🙂 . There is a surplus of wood pellets in East Canada has the paper mills (which are consuming those for energy producing) are closing down but sawmills are still producing wast amount. So Logistec and others are shipping those to Europe. Another long term upside, is that Canada just signed a Free Trade with Europe so maritime traffic should increase further to/from Europe over the next 2 years and Logistiec is in the best geographical position to benefit from that. Don’t get too excited, Canada – Europe Free Trade will not take into affect until 2015. Thanks for the input! Always great to have some local intelligence on what a company is up to and how the market is doing. I am amazed at how far Logistec has risen since I first wrote about it. The company is still a great investment for the long run, but a lot of the under-valuation that existed at the time of my post has dissipated. The 60-70% recent price runnup is a little bit too fast for me… The good thing is liquidity has increased so this should help the company for buying back shares at fair price – 2013 EPS should be around 4.50 – 5.00$ My guesstimate – as q4 is normally a good quarter – The St- Lawrence doesn’t froze until late December… Although we have a cold winter this year 🙂 Hopefully they will buy another concession (25th) soon with all the cash coming in. Q4 results were published last week. Not as good as I was hoping on the maritime side. I believe this could partly caused by loosing the aluminium stevedoring in baie-Comeau. On the good side, a new port handling minerals in the Artic, baie-deception, just started in January. They will investing 20m$ on maritime and 10m$ on Neidner of capex this year, in contrast to 10m$ normally. 20m$ is to increase capacity in Montreal (container handling inTermont, warehouse in mestco, and stevedoring in contrecœur) so they must feel bullish. Thanks for the commentary. I also was hoping for slightly better results, but I was satisfied and continue to view the stock as a good buy at these levels. Congrats. Logistec has done really well – both business and the stock. Up 50% ytd. I know you dont comment on price targets. But how do you decide to sell a winner like this ? Do you look at what kind of IRR you may get going forward (say P/e is already fair) so the rest will come from EPS growth only. Here’s the thing about us value investors…we tend to sell too soon. So long as Logistec’s valuation doesn’t reach lofty levels (I’d say 20x trailing earnings or so) and the business continues to hit on all cylinders, I am holding. I might sell some shares to control risk, but it remains one of my favorite companies to own. Logistec is investing like crazy this year to increase capacity and they are not stupid. They know something we don’t – that demand is there. The CEO Madeleine Paquin have been at the helm for too long and own too much shares personally to overspend. In the article, Paquin mentions that growth is coming from mining, strong demand for wood pellets in Europe and general merchandise. Your insight is greatly appreciated! Logistec’s management team is excellent. I’d love to see some business magazine do a profile of Madeline Paquin rather than the usual all-flash, no-substance tech CEOs. What she has done with Logistec in her career is extraordinary. Market cap for the combined firm is $648m. After adjusting for leases and NCI, EV is ~$676m vs. trailing EBIT of $35m or so (ballpark), so 19x EBIT. Over the long-term, ROICs have been around 11%, not particularly great. WACC is maybe 8% (stable business), so maybe pay a slight premium to invested capital ($310m), so maybe $425m as FV, and I’d want to buy lower than that…Just estimating all of this base on numbers, would need to go through reports in detail.. Seems like a good deal at your post but maybe not so much now? What am I missing? Hello and thanks for you comment. Sorry I didn’t see it before now. First, I am wondering where you got your EBIT figure. I get about $44 million CAD in trailing EBIT. And I think forward EBIT will be much higher. The company invested heavily this year, and they are smart investors. They’ll get a good return. Second, the company wisely invested in US east coast ports over the last few years while the CAD was strong, and will now benefit as US dollar earnings come back to the Canadian parent. I really can’t explain the pricing of the A shares. Makes no sense to me. But I tend to ignore it, because I’m buying the B shares exclusively. B shares rank equally in a buyout, but have a dividend preference, so it makes sense to buy B shares when the price is lower than A shares. Using the B share trading price gives a market cap of $479. Add minority interests and net debt, and you’re at $508 million. I think that’s a very fair price for a business of this quality. In my estimation, that’s less than 10x forward EBIT. Compare that to the valuations of many other lower-quality businesses. The picture is different for those buying A shares. They’re creating the business at a market cap of $657 million, or 13x forward EBIT if my estimate of $50 million in 2015 EBIT holds up. Honestly, that’s still not a crazy valuation for a firm of this quality, but it’s clearly much more expensive than the B share valuation. 1) What about operating leases? Isn’t port leasing akin to rent agreements for a retailer ? Capitalizing 2013 oper. lease expense of 20.4m at 7x is another 143m in debt. Using your numbers and adding back some implied lease interest, that’s 13x TTM EBIT. Isn’t this much more leveraged than it appears? 2) Isn’t BV of minority interests understated? 2013 NCI income of 3.3m vs. BV of 11.8m or 3.5x multiple. Even with minority discount, isn’t FV of that NCI much higher if the company had to buy out the remaining piece? So EV is even higher, maybe another 15-20m, depending on the fair value multiple? Would be interested in your thoughts..
Hello, and thanks again for the thoughts on Logistec. One certainly can view the company’s operating leases as leverage. After all, practically every fixed business expense (whether explicitly interest or not) can be viewed that way. But I’d argue that the company’s operating leases should hardly be viewed as potentially risky leverage, because the port servicing contracts the company holds are practically licenses to print money. In my view, operating leases increase risk where operating results are highly cyclical or sensitive to changing technology or consumer preferences. But Logistec’s earnings stream is practically the opposite: robust through economic cycles, unaffected by consumer tastes and not requiring high investment to remain technologically relevant. Because ports are a scarce resource, Logistec’s earnings absent all growth capex will tend to increase at a rate of at least nominal GDP growth. Possibly greater, if international trade grows at a rate faster than the world economy. And yes, I’d say the book value of the minority interests is distinctly undervalued. I’d place a value of at least 10x profits, based on the nature of the industry, which would be 33 million or so. 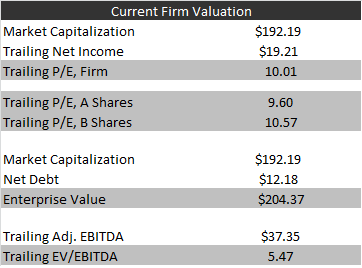 I nearly always view EV/EBIT as the best indicator of a business’s valuation, but I’m comfortable valuing Logistec using an adjusted free cash flow yield. Logistec’s maintenance expenditures should roughly equal depreciation over time, so I view net income as a reasonable proxy for free cash flow. On a trailing basis, Logistec B shares have a free cash flow yield of 7.5%. Based on Logistec’s size, management talent, and industry outlook, I expect the company to continue to grow its earnings and free cash flow at a double-digit rate for decades to come, pushing expected returns into the high teens. I am a buyer of Logistec B shares to a 5% net income/free cash flow yield, which would equal a price of $56 based on current earnings. However, I expect this price target to rise rapidly as earnings continue to compound. 1) on growth rates. the accounting change in ’09 really messes up historical comparisons, but looking at rolling 10-year sales CAGRs since inception, the company barely reached 10% CAGR in just 2 yrs (in 2000 at 10% and in 2003 at 10.3%). I come up with 7-8% normalized growth. (i.e. 1970-2008 = 8.2% CAGR). Isn’t double-digit growth expectations a stretch? 2) You say the stock has a 7.5% trailing FCF yield with D&A = MACEX. But then you go on to say that it can grow FCF at double digit rates going forward… But doesn’t it need the growth capex to grow at 10%+? No way it grows that fast without expanding into new ports, upgrading equipment, making acquisitions, etc. 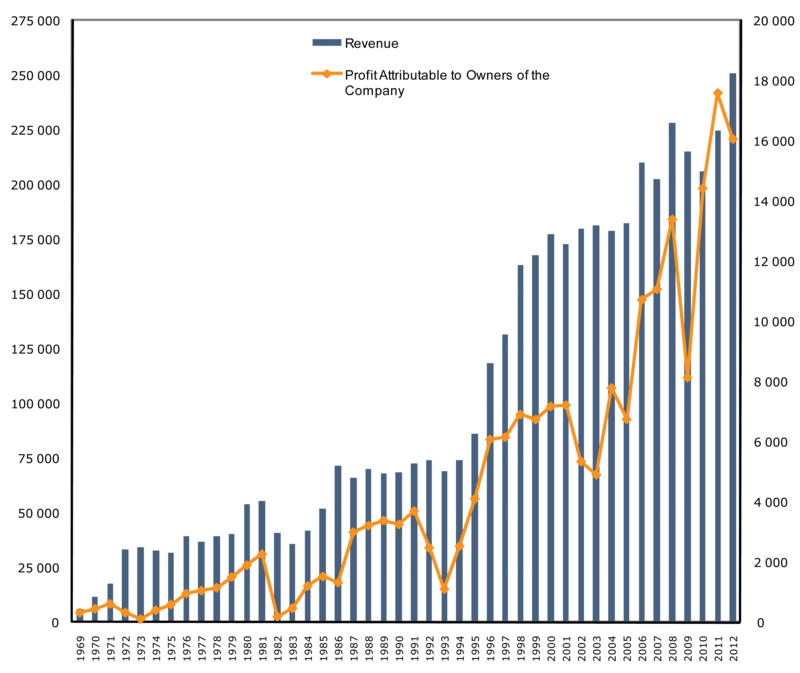 From 1995-2013, cumulative NI was 189m vs. FCF (after acquisitions) of $67m, or 35% conversion. I could get talked into 50% or so conversion as “normal”, depending which starting/end dates are used. So it seems that LGT has to reinvest a minimum of ~50% of earnings into growth capex in order to grow at 7-8% (or 10% in your estimates). This makes sense – ports are not asset-light businesses. With your method, i think you are giving them credit for growth without dinging them for the capex required, no? as I said, big fan of your work and this was a great investment in ’13..hope this discussion is food for thought..
Hello again, I always appreciate the comments! 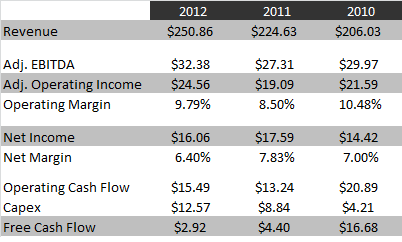 I also think that trailing NOPAT/EBIT/earnings figure of choice is distinctly understated versus forward figures. Logistec spent quite a lot in later 2014 to upgrade its facilities. The debt incurred is already reflected on the balance sheet and in enterprise value, yet the earnings benefit won’t arrive until this year. If it so happens that Logistec’s future results fall somewhat short of my own expections and more toward your own projections, I’d be all right with that. In my mind, potential returns of 11% or more are excellent for a business of this quality and resilience to the business cycle. And I do believe there’s plenty of room for growth. Despite its remarkable first 45 years or so as a public company, Logistec remains a tiny, tiny player. I view Logistec as one of the lower risk “stalwarts” in my portfolio models that I use to balance the risk of investments in businesses with less stable revenue streams or capital structures. As always, I appreciate the discussion. It always gets me thinking more deeply about my portfolio holdings, and that helps both me and my clients. Also, I should ask: if you had a new fund, would you be a buyer of a new position at these prices ($35 per B share)? 2) Devaluation favors exports, and manufacturing transformation, which should increase over time now especially in Eastern Canada (Quebec and Ontario). So I expect the manufacturing plant that Logistec serve will be firing at all cylinders (more inputs and more outputs). Straight line 15 years Cagr or 10 years Cagr can be misleading. Like I previously mentionned – last 15 years was really though for the east side of Canada, which is a manufacturing economy mainly exporter to USA, with the exchange rate going from 1.61 usd.cad to parity in 2012. On top of that their main partner the US went into the great recession. To maintain a barely 10% is truly exceptionnal. They also annonced a huge expansion of the Termont expansion from 500k to 1100k as I was alluding in my previous post. This is very positive for the long term. Market evaluation of the Termont subsidiary once the expansion will be completed, should be in the 700m+iin my opinion. The Montreal Gateway – the only competing container co. In mtrl was sold 500m$ This year. Errata MGT got sold 650m$ canadian I think Termont is worth more than that it is running at full capacity versus MB at much less than that.